I started with two partially frozen chicken breasts (the kind you can get in the big bag from those warehouse stores?) and sliced them across to open them up like an envelope. I didn’t want to cut them the entire way through, although I certainly could have done that to create four separate servings. Feel free to tackle this step however you like. I laid them on a piece of foil (I really hate to clean baking sheets, so I use foil anytime I can) and flattened them with my hands. I then mixed the creamy topping that would be the “sauce” to hold the cheese onto the chicken. For this recipe I used mayonnaise, dijon mustard, red wine, and dried parsley. I blended it all together with a whisk and then brushed the mixture all over the top of the chicken breasts to cover them evenly. Using a packaged blend of cheddar and colby, I spread the cheese over both chicken breasts and then topped them with salt and pepper. Since the chicken was so large, I decided to keep things simple and just roast some green string beans as the accompaniment for this dinner. I could have easily added mashed or baked potatoes, but I really wanted the chicken to be the star. To make the beans, I grabbed another baking sheet and lined it with foil (easy cleanup, folks… this is my favorite thing about foil!) and spread out the beans on the sheet. I then sprayed the beans with cooking spray and topped with salt & pepper. Baking this dinner was also pretty easy. I preheated the oven to 375 degrees and baked the chicken for about 40-45 minutes. I popped the beans into the oven underneath the chicken after the first 10 minutes, so they were cooking for 30-35 minutes. NOTE: I’ve been under-cooking beans lately, so I went a little overboard on the beans this time – will probably back their cook time down to 20-25 minutes next time, but they were still tasty. Once dinner was done and plated, I got rave reviews from my husband about the chicken. It was still juicy but cooked through, full of flavor and simply delicious. Changing out the flavors and using different ingredients for the “sauce” will be done next time, but this is a great way to start. Try using white wine, horseradish mustard, different spices, anything that your family likes is fair game in this one. You could even make it into an Italian version with italian spices and an Italian blend of cheeses… it’s really all up to you. Enjoy and let me know what you try! Our “dating” anniversary was this past Thursday and, while we don’t go to great lengths to celebrate it, I was in the mood to make a special dinner to commemorate this auspicious occasion. My husband loves steak, but that wasn’t something I could easily cook in our current apartment, so I opted for a seafood dinner… specifically, a special seafood alfredo. For this seafood alfredo, I decided to use the meat of one cooked lobster (diced), one pound of large shrimp (sliced in half lengthwise and roasted in a 400 degree oven with salt/pepper/herbes de provence/smoked paprika until pink and curled), and one pound of angel hair pasta (cooked al dente’). NOTE: A traditional alfredo sauce is made by melting equal parts butter and heavy cream together before adding in mouthwateringly large amounts of parmesan cheese. Since heavy cream is something that I (1) didn’t remember to purchase and (2) typically try not to use because it doesn’t agree with my stomach, I opted for a unique way to create the taste of an alfredo sauce without the dense feel. I do hope you’ll consider trying it this way sometime as it’s rather tasty. For my alfredo sauce, I started by melting a stick of margarine and a dollop of olive oil in a saute’ pan. Once the margarine was melted, I added a generous splash of white wine (I used a local crisp white wine, but this would have been a great place to use either an oaked Reserve Chardonnay OR a sweeter Vidal Blanc) and then added two palms full of Parmesan Cheese and some garlic, whisking everything together well. Once the cheese is fairly well melted, you’ll notice that it doesn’t look entirely appealing at this point. It seemed a bit thin and didn’t really have the creamy texture that I wanted, nor did it have that amazing taste that I wanted. It was a bit salty to taste, so I added freshly ground pepper and some smoked paprika, along with two spoons of creme’ fraiche that I had picked up at the store. The sauce thickened up nicely, but to complete the sauce I added a single wedge of Laughing Cow light swiss cheese, which melted into a creamy bit of heaven. NOTE: I added the diced lobster to the sauce to warm the meat. When ready to plate the meal, I chose not to add the shrimp to the sauce. Instead, I placed a serving of the pasta on each plate, divided up the shrimp among the plates and then spooned the sauce (with lobster bites) over the pasta and shrimp. I had popped a loaf of crusty bread into the oven (as you can see in the corner photo) and sliced this up to serve along with dinner. While I did cook some snow peas to add a vegetable to round out our meal, these went largely uneaten and could have easily been avoided altogether. In the end, we had a really lovely anniversary dinner. 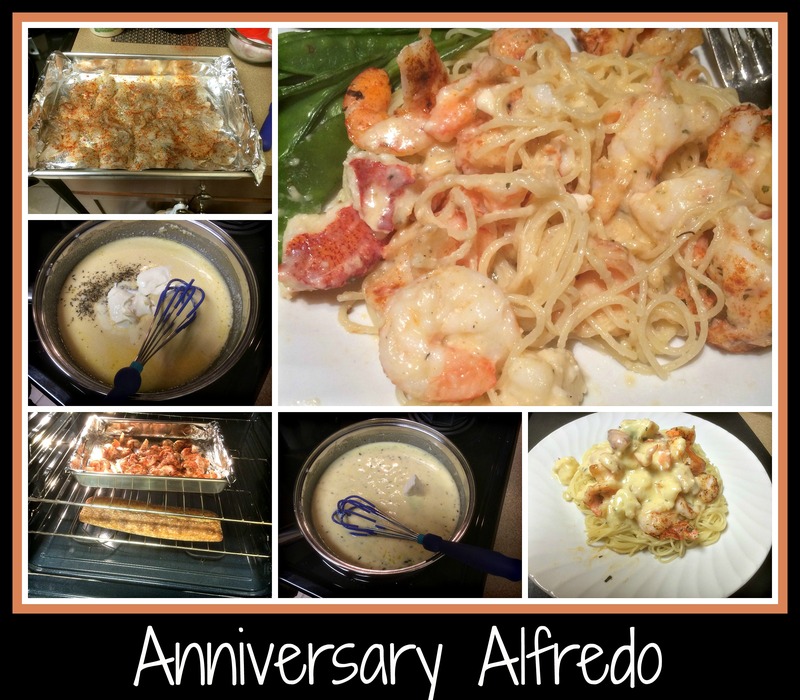 It’s been 27 years since our first “date” and 26 years since we married, so I thought it was fitting to name this recipe as our Anniversary Alfredo. I’ve been blessed with a wonderful man who knows how much I like to cook and will eat just about anything I cook, wine or no, because he loves me. How much better can life get than that? 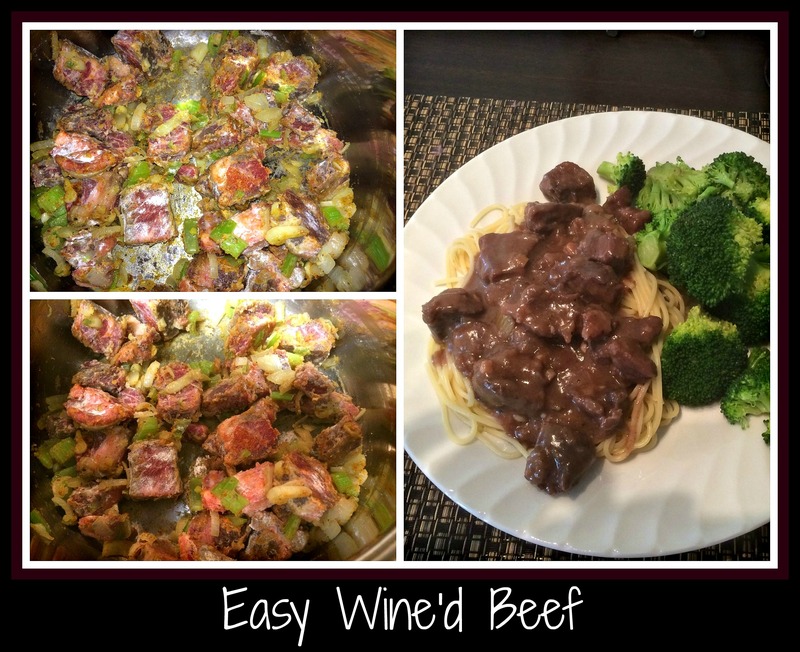 Happy Anniversary to my husband… wishing everyone else a fun time with this recipe! LAST NOTE: If you don’t like seafood, this recipe would be lovely with roasted bites of chicken, beef or even simple roasted vegetables. Cook what you like and your loved ones will enjoy it! 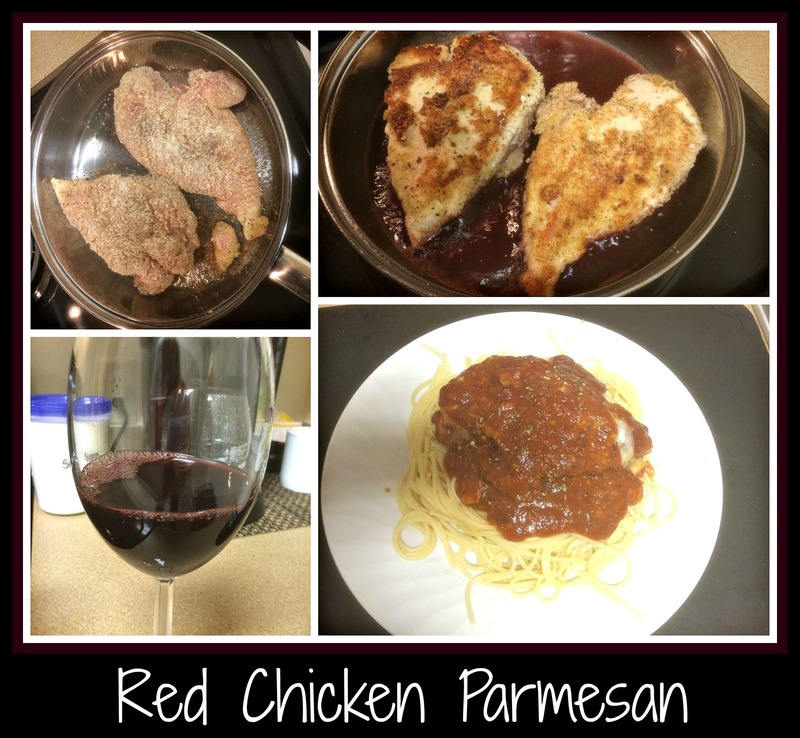 Chicken parmesan is one of those “easy/go-to” recipes for me. Saute up some chicken, add sauce, top with cheese and serve with spaghetti noodles. That’s the quickest way to explain this dish, but I love to add a little bit of flair when I’m cooking (almost always with wine), so my version is a little snazzier. I start with two chicken breasts and roll them in a little egg white substitute before patting them down in some seasoned bread crumbs. NOTE: This is where you have some creative and quantity options – if you’re serving more than two people, use more chicken. If you want to use Panko or cracker crumbs or even parmesan cheese at this point, feel free. This is your meal, so enjoy using your favorite products. Once the chicken is prepared, you need to prepare your pan. Using a nice size saute pan, melt a mixture of a little butter and a bit of olive oil until it’s starting to sizzle a bit. Place your chicken, breast side down, into the hot oil and allow the meat to cook until it lifts up easily (this will tell you when it’s done). Flip the chicken and allow it to cook the same way on the other side. Your chicken is now seared but not thoroughly cooked. Since the “pretty” side is facing up, I like to leave the breasts alone at this point. I add some red wine to give the chicken breasts some liquid to soak up and allow to cook thoroughly. Note: Use as much or as little red wine as you’d like at this point. You can also substitute chicken stock if you’d prefer, but I do love the depth added by the wine. I usually use a favorite dry red wine, but I don’t mind using a lovely tasting Malbec or a Meritage if that’s what I’ve got in my cabinet. The idea to remember is to use a wine you’d like to drink because if you cook with wine, you’re concentrating the flavors and if you wouldn’t want to drink it, you definitely don’t want to cook with it. After adding the wine, I also add some tomato sauce. I love having the time to make my own sauce, but for the ease of apartment living at the moment, I use some jarred sauce, mix in the wine and the pan drippings, and pop the entire pan into the oven to allow it to bake (usually around 325 degrees or so) until we’re ready for dinner… just remember to leave enough time to cook your pasta so that’s ready when you want to plate your meal. An extra note: I have found if you pop a few ice cubes into the pasta when it’s finished cooking, your pasta won’t stick. I’m not exactly sure why this happens, but it works well for us… better than adding oil or butter to keep the pasta from sticking to itself. 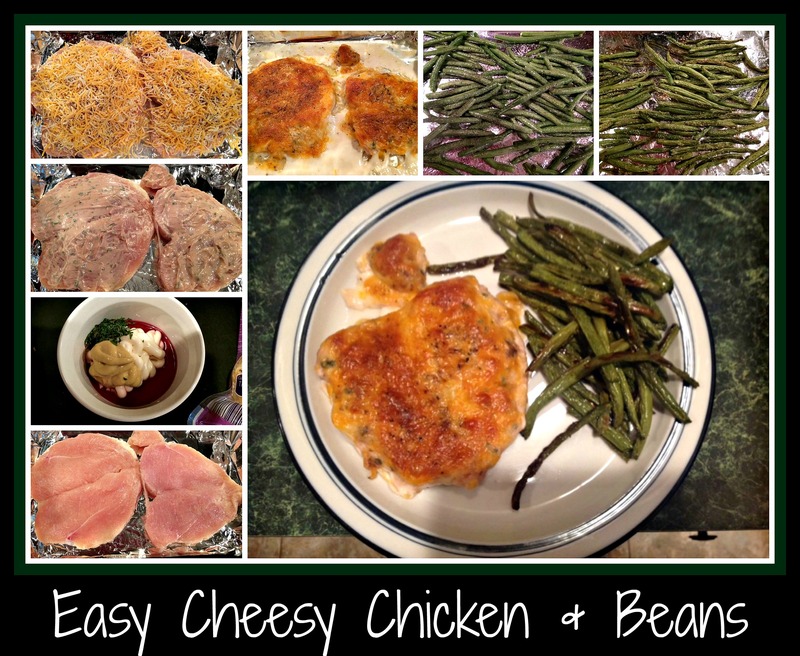 A few minutes before you’re ready to pull dinner out of the oven is when I like to top the chicken breasts with cheese. How much or how little is really up to you. For the meal pictured, I placed a slice of provolone cheese each breast and then sprinkled on some Parmesan cheese to melt in the oven before serving the chicken and sauce over the pasta. Enjoy personalizing this meal and making it your own… before long, you’ll have come up with your own favorite variation! I made a really delicious dinner last night that I want to share with you. It was very simple, as most of my meals are in our current apartment situation, but the result was great. Feel free to add a salad or green vegetable if you so desire… and bread or a dinner roll is always a great way to stretch your dinner. I started by marinating two chicken breasts in a mixture of a lightly sweet red wine (Boordy’s Chambourcin Merlot blend could work here), a touch of olive oil, some garlic salt, honey, and herbs de provence. I put everything into a plastic, resealable bag and left it in the fridge for the day. NOTE: I always place a plastic bag into a bowl if I’m leaving it in the fridge for the day so there’s no risk of mess to the fridge if anything happens. I also reconstituted a half cup of dehydrated sun-dried tomatoes and sliced them to add to the pasta for flavor and color. This was easily done by pouring some hot water over the dehydrated tomatoes and then allowing them time to plump up before slicing them. Doing this early in the day (or even the night before) makes things so much simpler when you start cooking. When I started cooking, I decided to toast some whole wheat pasta in garlic butter to add some flavor to the side portion of this meal. Rather than leaving the whole wheat pasta (spaghetti) whole, I chose to break it up into 2″ pieces so the garlic butter would have a better chance of toasting all the pasta. Once this was done, I added a handful of bowtie pasta and the sliced sun-dried tomatoes to the mixture and allowed the pasta to pick up some of the flavor before adding a few ladles of chicken stock and some red wine to cook the pasta thoroughly. I then began cooking the chicken. I heated a touch of olive oil in a large skillet and sauteed the chicken breasts on both sides until they were nicely browned but not cooked through. I added the leftover marinade from the plastic bag and stirred up the browned bits from the bottom of the pan. At this point, I could have simply left the chicken on the stovetop to cook (with the lid on), but I’m not entirely comfortable with the electric stovetop that I’m currently using so I chose to alter the recipe in mid-stream. 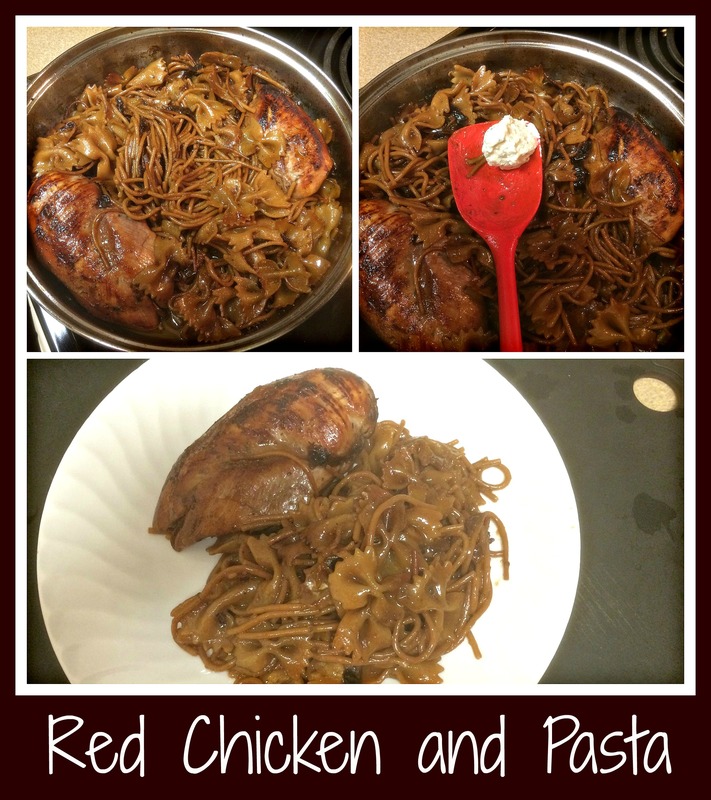 I pushed the chicken off to the sides of the pan and added the pasta/liquid into the pan. I then put the lid on the pan and popped it into a 350 degree oven to braise everything in the liquid until we were ready for dinner. Just before serving, I added a Tablespoon of soft cheese to round out the flavors of the pastas, sun-dried tomatoes, *and* the chicken. NOTE: Some of the bowtie pasta didn’t get all the way into the liquid and ended up a little crunchy, which is NOT something my husband enjoys. Make sure to keep stirring the pasta throughout the cooking process to make sure that all the pasta is cooked thoroughly before serving. Have you ever had leftover Sausage Muffins and not known what to do with them? It *is* a dilemma, right? I really hate to waste food, so when I purchased too many sandwiches one Sunday morning (and ended up bringing five of them home that evening), I knew I needed to come up with a workable solution. 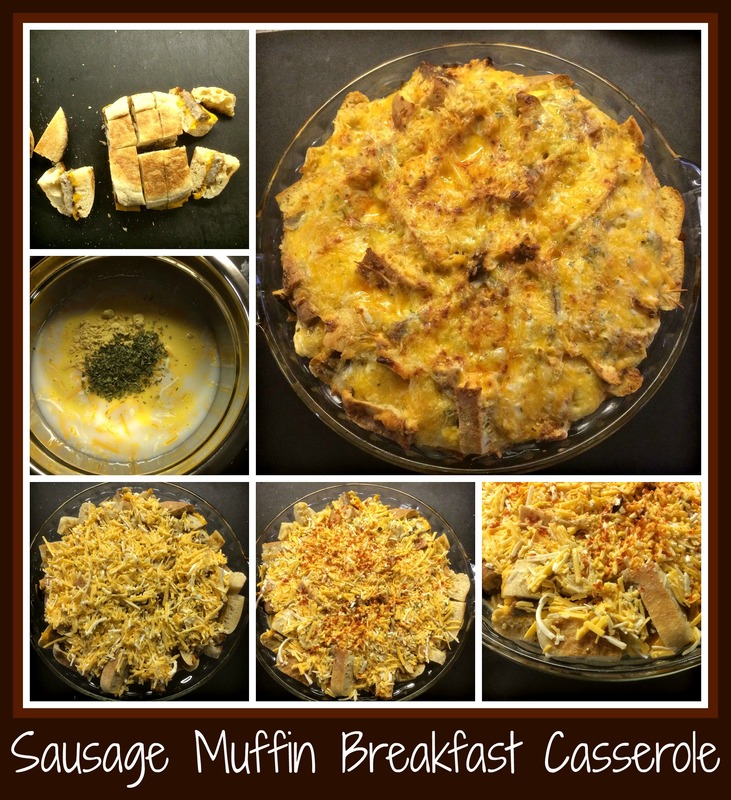 After thinking about the composition of the sandwiches for a bit, I came up with a great way to use these tasty treats in a way that changed them into something relatively healthy and totally yummy… a breakfast casserole! NOTE: This is a recipe that is best made the night before you plan to bake it, so the bread has time to soak up the liquid. I actually put this casserole together when I brought the cold sandwiches home from work on Sunday night so I would have something ready for breakfast that I could also take into work to share with co-workers on Monday. I started with five sausage muffin sandwiches. The ones I purchased simply had english muffins, a sausage patty, and some cheese, so I diced them into bite-sized pieces and loaded them into a pie plate, sprayed with cooking spray. I then made a mixture of 3/4 cup egg substitute, 1 cup unsweetened vanilla almond milk (you could certainly substitute any milk product you like, but I really like almond milk for baking… and for the low calorie count), 1/2 cup shredded 2% cheddar cheese, 1/2 cup shredded 2% colby cheese, 1 Tablespoon dry mustard, 1 teaspoon each of parsley and herbs de provence, and 1/2 cup James River Cellars Reserve Chardonnay white wine. As with all my recipes, you’re welcome to substitute your favorite ingredients wherever you see something you’d prefer. Different flavored cheeses and any sort of white wine you like (or have open) is a great way to personalize this recipe. I whisked the liquids and cheeses together and poured them over the sausage muffins in the pie plate. I then pressed the muffins down into the liquid so they would have the best chance to become thoroughly soaked before I baked the casserole in the morning. I covered the casserole with some plastic wrap and allowed the dish to sit overnight. NOTE: You can also place a weighted plate on top to continue the pressure on the casserole until you bake it. I ended up adding an additional drizzle of 1/4 egg substitute before baking in the morning because mine just didn’t look quite “soaked” enough. Just before baking the casserole, I garnished the top with some smoked paprika and popped the dish into a preheated 350 degree oven for 35-40 minutes. This was a really delicious casserole. I shared it with my co-workers and it got rave reviews from everyone, which made me very happy. I was able to create something that tasted totally “new”, using something that otherwise might have gone to waste. To me, that counts as a win-win! I hope you’ll try this recipe sometime. Being able to make a totally new meal with a leftover ingredient is pretty fun!